What Is Happening in Rome in February? In lovely Rome, February is chilly – the average temperature highs are in the mid-fifties Fahrenheit (13 degrees Celsius) – and occasionally rainy. But crowds are usually thinner, a few sunny days may sneak out, and there are a few important festivals to warm your heart. The most important festival in Rome in February is the eight-day-long festival called Carnevale. Carnevale is the Italian name for Mardi Gras, the annual celebration preceding Christian Lent. Lent is a religious observation in which its participants hold 40 days of fasting and prayer. That period begins on Ash Wednesday and ends on Easter Sunday: The run-up to Lent is one big party, particularly on the weekend just prior to Martedi grasso, or Fat Tuesday, the last day of the festivities. Dates for Carnevale in Italy vary with the official Vatican calendar for Easter, but the festival starting date is always between February 3 and March 9. Events are held throughout the city, beginning with the opening parade on Via del Corso, replete with Italian masquerade masks and elaborate costumes. All the major piazzas in Rome—Piazza di Spagna, Piazza Navona, and Piazza della Repubblica—hold theatrical and children's events. Castel Sant'Angelo usually has a decorated artificial ice rink for mid-winter skating. 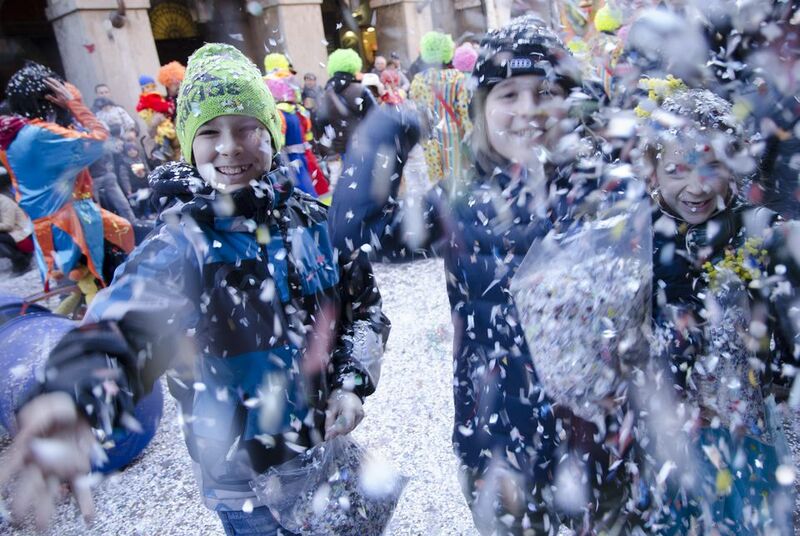 Carnevale is also an excuse for kids to be mischievous, from dousing friends and adults with handfuls of confetti, to even throwing raw eggs and flour at each other. You'll see sidewalks strewn with thousands of little pieces of colorful confetti. The Piazza del Popolo, where fierce riderless horse races once occurred, today features horse-back costumed parades during Carnevale, culminating in a horse show where equestrian stars and their horses perform acrobatics, dressage, and dancing to music. You can also find historical reproductions of 16th-17th-century Italian plays (in Italian), a merry-go-round, puppet shows, and holiday-themed sweets. All the parties end on Fat Tuesday (also known as Shrove Tuesday or Mardi Gras). If you're staying in Rome for Lent, you will find Rome a quieter, more reflective place. Station Churches scattered through the city have been selected by the Vatican to host congregate masses on each day of Lent starting at 7:00 AM. Although there are no processions from church to church, each church has its own day throughout the period. During Holy Week, the most beautiful churches in Rome are selected for worship, including the Basilica di Santa Sabina, where the Pope celebrates Ash Wednesday. Valentine's day is the Feast day for St. Valentine (Festa di San Valentino or La Festa degli Innamorati) in Italy. San Valentino was a Roman priest who lived in Rome in the 3rd century; he was an early Christian who married Christian couples in secret and was martyred on February 14, 269. Today, modern Romans celebrate by giving each other flowers, chocolates, and cards. Many restaurants offer specials with romantic candlelit dinners. Museums and other entertainment events around the city often have two-for-one entry prices, and the world-famous chocolatier Perugina makes a Valentine's Day edition of their fabulous Baci chocolate, which you'll see for sale everywhere. Lovers once fastened padlocks to Rome's Ponte Milvio and threw away the key to immortalize their love. Unfortunately, the custom became too popular and the city government was forced to cut off thousands of the padlocks and ban the practice. Other lovers remember Audrey Hepburn and Gregory Peck in the 1953 movie Roman Holiday by visiting the film locations throughout Rome including the Spanish Steps, the Trevi Fountain, and the Mouth of Truth (Bocca della Verita). Stores in Rome and the rest of Italy hold huge sales, or saldi, twice a year, in winter and summer. Winter sales start in January and last until early March, or until winter merchandise is sold-out. This is a chance to scoop up huge bargains, particularly on fashions and accessories. Bargain hunters will find more affordable stores lining all of Via del Corso, mid- to higher-end shopping on Via Cola di Rienzo near the Vatican, and super-high-end designer shopping around Via Veneto and the Spanish Steps. Yet regardless of how chic the store, everyone hangs out the "saldi" sign in January, and you can find great prices as merchants make room for spring releases.